Most Trailers are wired with a Standard Flat (4) Connector, Most Imported and Domestic Motorcycles and Scooters have a (5) wire system, Our wiring converters, shown below, adapt import and domestic motorcycles with separate turn signals and stop lights (5-Wire System) to standard trailer taillight wiring (4-Wire System). In a 5- wire system, a separate wire is used to carry each of the stop, turn, and running light functions to the taillight assemblies. On most trailers, the stop and turn signal functions are sent through the same wire. 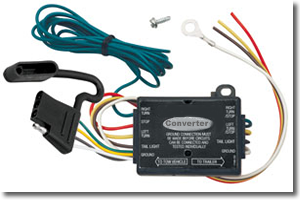 When looking at the rear of the motorcycle, if the Red tail lights and brake lights are in the same unit, and the turn signals are Yellow or Red and in a separate unit, it is a 5-wire system and you will need a converter to hook up lights Safely, to a 4 Wire trailer system! If the Stop, Tail, and Turn signals are all in the same unit and colored Red you have a (4) wire system that is compatible with our trailer and needs no optional converter, you just need a flat four plug available at any local auto part stores.. When looking at the rear of the trailer, if the Red tail lights and brake lights are in the same unit, and the turn signals are Yellow or Red and in a separate unit, it is a 5-wire system and you will NOT need a converter to hook up lights Safely, to a 5 Wire motorcycle system! If the trailer and motorcycle both have a (5) wire system, you need no wiring converter, you just need a corresponding Flat (5) Male & Female "plug set", available at most local auto part stores..
Indians with Computer and Can-Bus ~ "Click Here"
Harley Davidson 2014 + with Computers and Can-Bus ~ "Click Here"
* "Does Not" protect motorcycle computer systems. Will work with either LED/standard incandescent bulbs (input/output). 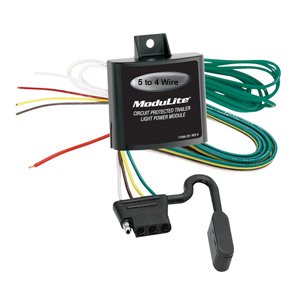 Rated for up to 2.1 amps for Turn/Stop circuits and 7.5 amps for Taillight circuit. * Has no overload or short circuit protection. Designed for usage from -40C to +85C temperature ranges. Designed to prevent feedback to the vehicle circuits and components. Operating voltage range 9 to 16 volts (12 volt system). Circuit Protected Taillight Converter with 4-Flat End. Adapts import and domestic motorcycles & scooters with separate turn and stop lights (5-Wire System) to standard trailer taillight wiring (4-Wire System). In a Five wire system, a separate wire is used to carry each of the stop, turn, and running light functions to the taillight assembly. On most trailers, the stop and turn signal functions are sent through the same wire. Short circuit protection safeguards itself and the tow vehicle against harmful electrical shorts and miss-wire situations. Circuit automatically resets once the module cools. Adapts a 5 wire system on the towing vehicle to a 4 wire system on the trailer. Works with most vehicle with multiplex wiring system for lighting. * Protects Motorcycle computer systems. Adapts "High End" import and domestic motorcycles & scooters with separate turn and stop lights (5-Wire System) to standard trailer taillight wiring (4-Wire System). In a Five wire system, a separate wire is used to carry each of the stop, turn, and running light functions to the taillight assembly. On most trailers, the stop and turn signal functions are sent through the same wire.